Now available: annual bibliographies starting in 1960, 1970, 1980, 1990, follow links. See also: 2003, 2004 and 2005, 2006 or 2008. Note cumulative scientific bibliography for the 2000's (with links to earlier decades). Cruising: Cape Town, South Africa; East London, South Africa; Durban, South Africa; Mayotte, Comoros Islands; Mombasa, Kenya. Wakelam, S., 2007, Two Men from Delft, BBC Radio 3 Drama, 2015-2130h, 4 February. Viol played by Vanessa Coode. Directed and produced by Jeremy Mortimer. Link on http://www.bbc.co.uk/radio3/dramaon3/pip/9vvpq/ 'see what van Leeuwenhoek was seeing through his microscope' leads to http://www.brianjford.com/wav-spf.htm. BJF, 2007, Vote of Thanks for lecture by Dr David Vaughan, 'The calving of Larsen-B and other phenomena, Climate Change in the Antarctic, Cambridge Society for the Application of Research, Churchill College Cambridge, 1930-2000h, 19 February. BJF, 2007, President's report, Association of Past Students, Cardiff University, 23 February. Johnston, Laura, 2007, New research society president announced (with photograph), Cambridge Evening News: 17, 287 February. Dibbs, Sylvia, 2007, Biological education [letter citing Brian J Ford autumn leaves article in Biologist, q.v. ], Biologist 54 (1): 11. BJF, 2007, review of 'Creative Teaching - Science in the Early Years and Primary Classroom' [in] Journal of Biological Education 41 (2): 94-95. Johnston, Laura, 2007, [reports CSAR meeting with comments by Brian J Ford] Expert calls for change in disease rules, Cambridge Evening News: 9, 7 March. Elliott, Chris, 2007, Don't let hoaxers fool you - beware the trickiest day of the year (with colour photograph) Cambridge Evening News: 8, 31 March. Report, 2007, The Cambridge Society gains New President [with colour photo], Discover Whittlesey: 5, April. Report, 2007, New President for Society of the Application of Research, Cambridge Reporter, 18 April. Report, 2007, Brian J Ford to chair meeting of CSAR, Cambridge Reporter, 25 April. BJF, 2007, Submission to National Lottery on behalf of The Eastrea Centre (for private distribution), Eastrea Village Hall Foundation, 22 pp, 30 April. Johnston, Laura, 2007, Stem cells give hope on spinal injuries, Cambridge Evening News: 5, 3 May. BJF, 2007, Science Wars: Journalists and scientists at cross-purposes, extemporised presentation, moderator Ms Pearl Maria Forss of Channel News Asia, Café Scientifique, National Science Centre, Singapore, 1930-2100h, 10 May. BJF, 2007, The Tyranny of Truth - How and why British media collide with science, I2R Distinguished Lecture, PowerPoint presentation at Institute for Infocomm Research, Singapore, 1000-1100h, 11 May. Report, 2007, Brian J Ford lecture in Singapore (with colour photo), Lian He Zao Bao: 10, 12 May. Forss, Pearl, 2007, interview with Brian J Ford on future of food, Channel News Asia Morning Programme (7 mins), 20 May. Report, 2007, Brian J Ford on Cultured Meat from Channel News Asia web site, 27 May. Ferrari, Nick, 2007, interviews Brian J Ford on China's increase in carbon dioxide production, Breakfast Show, LBC Radio, 0706-0715h, 21 June. BJF, 2007, Making sense of e-learning - Tyrannical Truths and Elusive Realities, address to UK Council for Graduate Education, Gilbert Murray Conference centre, University of Leicester, 1130-1215h, 3 July. BJF, 2007, Hemostasis update, 1055-1115h, 9 July. BJF, 2007, The e-learning Imperative - microscopy at a distance, An Evening with Brian, Inter Micro 07, Chicago, 2000-2100h, 9 July. BJF, 2007, World's Worst Microscopy, Inter Micro 07, Chicago, 1400-1420h, 11 July. BJF and Pickett-Heaps, Jeremy, 2007, Working with Living Cells – Triumphs, Tribulations and Tragedies, workshop at McCrone Research Institute, 12 July. BJF, 2007, Production and use of a bead-lens Microscope, workshop at McCrone Research Institute, 12 July. McCrone Research Institute, Chicago, Illinois. Ferrari, Nick, 2007, interviews Brian J Ford on the Save The Earth concerts in support of Al Gore's environmental campaign, Breakfast Show, LBC Radio, 0712-0720h, 10 July. 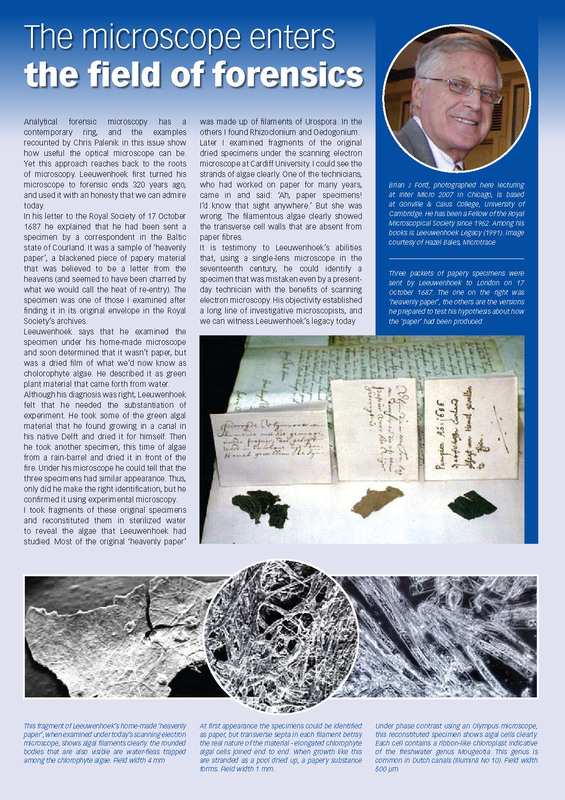 BJF, 2007, Antony van Leeuwenhoek's Microscope and the discovery of Giardia, Microscopy and Analysis: 5-7, July. Penfold, Samantha, 2007, Test Tube Meat and Fries (children's magazine article). Sailing: Tilbury, London; Invergordon, Scotland; Stornoway, Lewis, Outer Hebrides; Tobermory, Mull, Inner Hebrides; Dublin, Ireland; Hugh Town, St Mary's, Scilly Isles; St Peter Port, Guernsey; Honfleur, France; Tilbury, London. 2 - 11 September 2007. Southwell, Fae, 2007, interviews Brian J Ford on conservation in Eastrea and loss of the Dovecot, BBC television Look East programme, 1830h and 2225h, 4 September (copy in archive). Haase, Susan, 2007, [cites Brian J Ford in Nature, 323: 763, 1986 in] Atmospheric CO2 and the N-nutritional status modifies nodulation, nodule-carbon supply and root exudation of Phaseolus vulgaris L, Soil Biology and Biochemisry, 39 (9):2208–2221, September. BJF, 2007, Robert Hooke [chapter in] The Great Naturalists, editor Rob Huxley, Natural History Museum, London: Thames & Hudson. 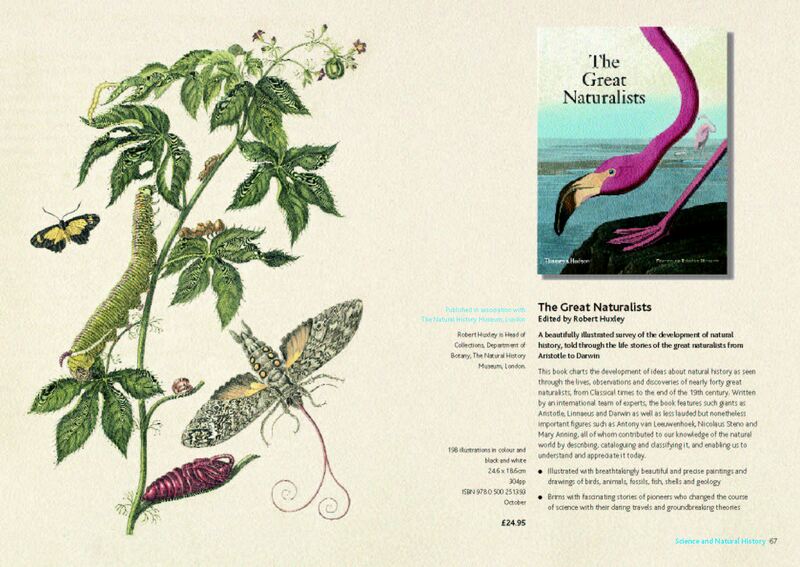 BJF, 2007, Antony van Leeuwenhoek [chapter in] The Great Naturalists editor Rob Huxley, Natural History Museum, London: Thames & Hudson. Wheelis, M., 2007, publishes micrographs of cork and blood smear with Leeuwenhoek microscope [in] Introduction to Microbiology, also Instructor's Toolkit (digital form), Sudbury MA: Jones & Bartlett Publishers, Inc.
BJF, 2007, The World's Worst Microscopy, invited lunchtime lecture to Photonex Conference, Stoneleigh Park, Coventry, 1230-1330h, 18 October. BJF, 2007, Enlightening Neuroscience, Microscopes and Microscopy in Eighteenth Century Neurology" [chapter 2 in] Whitaker, Harry; Smith, C. U. M. & Finger, Stan, (editors) Brain, Mind and Medicine: essays in 18th century neuroscience: 29-41, Springer. BJF, 2007, Linneaus and Life under the Microscope, illustrated tercentenary presentation to Linnean Society of London, Burlington House, Piccadilly, 1815-1915h, 11 October. (Video recording in archive). BJF, 2007, The Microscope enters the Field of Forensics, Illumin8: 3, Olympus, October. BJF, 2007, Observing the Invisible - celebrating Leeuwenhoek's 375 anniversary, inaugural presidential address to Cambridge Society for the Application of Research, with Professor Sir Sam Edwards in the chair, Churchill College, Cambridge, 1930-2100h, 22 October. (Video recording in archive). Dundon, Tara, 2007, (quotes Brian J Ford in) Joy as village 'regains its heart', Peterborough Evening Telegraph: 10, 3 November. [See also leader article, 'All hands to the pump' ibid: 6). Self, David, 2007, (quotes Brian J Ford in) If you asked me, I could write a Book, Fen Blow column, Cambs Times: 12, 9 November. Where the Caribbean came from, Sirocco Lounge, 1815-1900h, 16 November. Secrets behind the best and worst Caribbean photos, Sirocco Lounge, 1530-1615h, 18 November. Cruise Videos - the good, the ban and the dreadful, Sirocco Lounge, 1500-1546h, 21 November. Amazing Future of the Amazon Jungle, Sirocco Lounge, 1530-1615h, 23 November. Secret Language of Nature, Ingenious Plants and Animals all around us, Sirocco Lounge, 1530-1615h, 27 November. Appearnce as King Neptune, crossing the line ceremony, Verandah afterdeck, 1030-1130h, 22 November. Performance on piano (and Clive Carrington monologue), Yacht Club, 2300-2330h, 22 November. Panellist in 'Call my Bluff', with Mr Neil Horrocks, Dr Kevin Elsby and Ms Angela Cherry, Sirocco Lounge, 2145-2230h, 24 November. Bridge commentaries from 24 November. [see also: Spirit of Adventure Today: 3, 16 November]. Sailing Bridgetown, Barbados; Bequia, Windward Islands; Grenada, Windward Islands; Plymouth, Tobago; Georgetown, Guyana; Paramaribo, Surinam; Devil's Island, French Guinea; Belém, Brazil; Breves, Brazil; Almerim, Brazil; Alter do Chao, Brazil; Santarém, Brazil; Parintins, Brazil; Manaus, Brazil; 14-28 November. Peres, Michael, 2007, publishes Brian J Ford study of Pulex imaged with a Robert Hooke microscope, Focal Encyclopedia of Photography, ISBN 0-240-80740-5, 4th Edition: 593, Amsterdam & London: Elsevier. BJF, 2007, Chairman's introduction to presentation 'Water that does not wet hands, the Alchemy of Michael Sendivogius; and how it helps in teaching chemistry to school children' by Dr Zbigniew Szydlo, Teacher of Chemistry, Highgate School and Royal Society lecturer, Cambridge Society for the Application of Research, Churchill College, Cambridge, 1930-2100h, 3 December. BJF, 2007, illustrated reports on sites for the Eastrea Centre; the Storers' Bursary winners, etc., [in] Discover Whittlesey: 24-26, December issue. BJF, 2007, Celebrating Leeuwenhoek's 375th birthday - what could his microscopes reveal? InFocus magazine, 8: 20-35, December. Report, 2007, Brian J Ford on Antony van Leeuwenhoek [in Spanish], Naturalaleza de la Luz, Optica website, December. BJF, 2007, Illustrated presentations aboard M/V Spirit of Adventure 'Christmas in Antarctica' expedition. Beautiful Pictures and Horror Stories, Sirocco Lounge, 1815-1900h, 21 December. Christmas and Tradition, Sirocco Lounge, 1815-1900h, 22 December. Cruise Videos - the good, the ban and the dreadful, Sirocco Lounge, 1600-1645h, 07 January. [See also Spirit of Adventure Today: 3, 6 January 2008]. Sailing: Buenos Aires, Argentina; Grytviken, South Georgia; Stromness, South Georgia; Gold Harbour and Drygalski Fjord, South Georgia; St Andrew's Bay, South Georgia; Stanley and Sparrow Cove, Falklands; West Point Island, Falklands; Penguin Island, South Shetland; Brown Bluff and Esperanza Research Station, Antarctica; Barrientos Island; Yankee Harbour, Greenwich Island; Gonzales Videla Research Station and Neko Harbour, Antarctica; Verdansky Research Base, Antarctica; Planeau Island, Argentine Islands; Port Lockroy and Jougla Point, Antarctica; Ushuaia, Argentina. 18 December 2007 - 9 January 2008. Move to previous year, 2006, or next year.